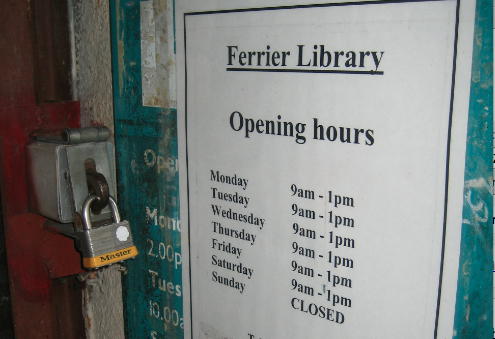 Greenwich Council have refused to say when the Ferrier Library will close down, despite demolition teams working metres away. Staff say they have not been told when they will have to move out and Greenwich Council have also refused to tell Kidbrooke Kite the date. It had been expected that the library would close before Christmas but staff have repeatedly been given "stays of execution" by the council. They have also not been told of any plans for new library facilities in Kidbrooke Village, if indeed any such plans exist. This week we asked the council if they did have any plans to replace the library facilities that they are demolishing. Again, we didn't get a reply. Last year the council boasted that "There will be no cuts to the library service in Greenwich" with leader Chris Roberts telling the public that "all our libraries will remain open." They later admitted that this wasn't true but said that it didn't matter because Kidbrooke's only library was "a bloody awful place." 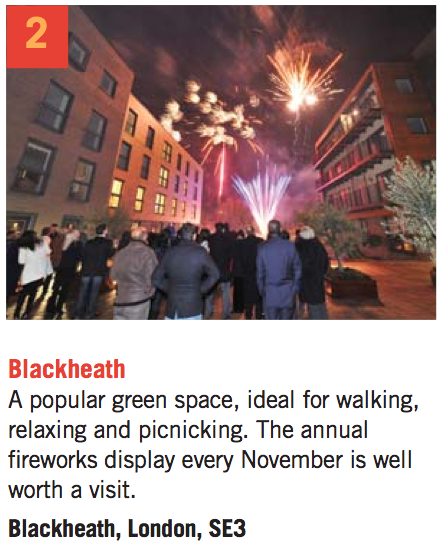 So "bloody awful" in fact that they can't even be bothered to say when it will be demolished. 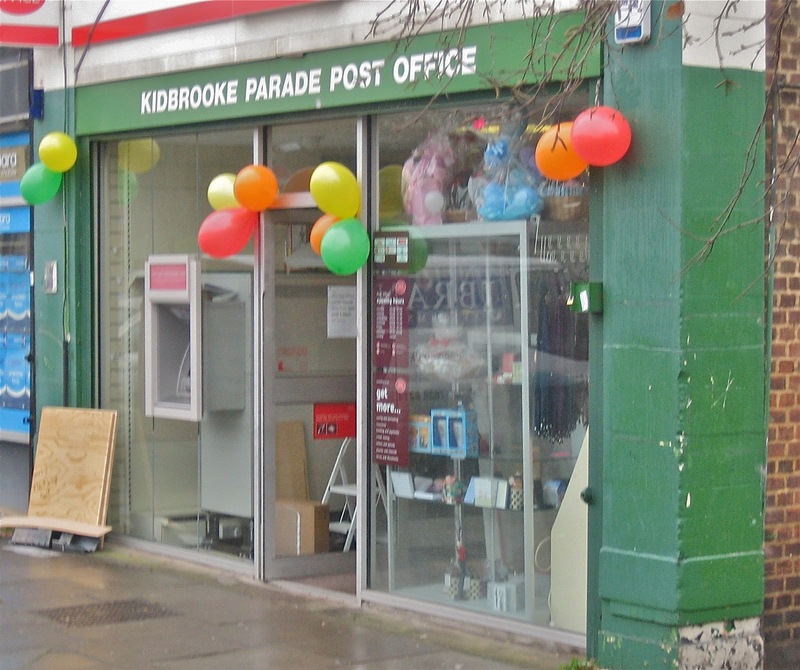 A new free to use cash machine was today installed outside the Kidbrooke Parade Post Office on Rochester Way. As you can see the Post Office owners are quite excited about it, as indeed are we at the Kidbrooke Kite. 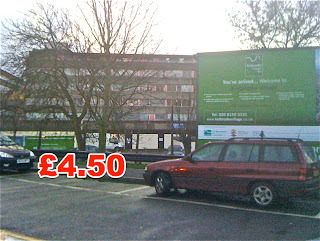 Gone now is our long trek to the petrol station at the northern end of Kidbrooke Park Road just to avoid debit card charges on a newspaper. I'm not sure why it's taken almost two years for it to be installed, but here it is. So that's a decent cafe and a cash machine. 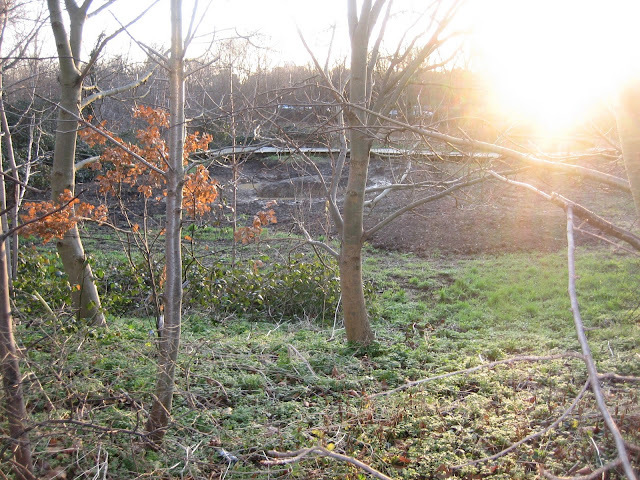 All we need now is a pub and Kidbrooke's pretty much sorted. That's right. 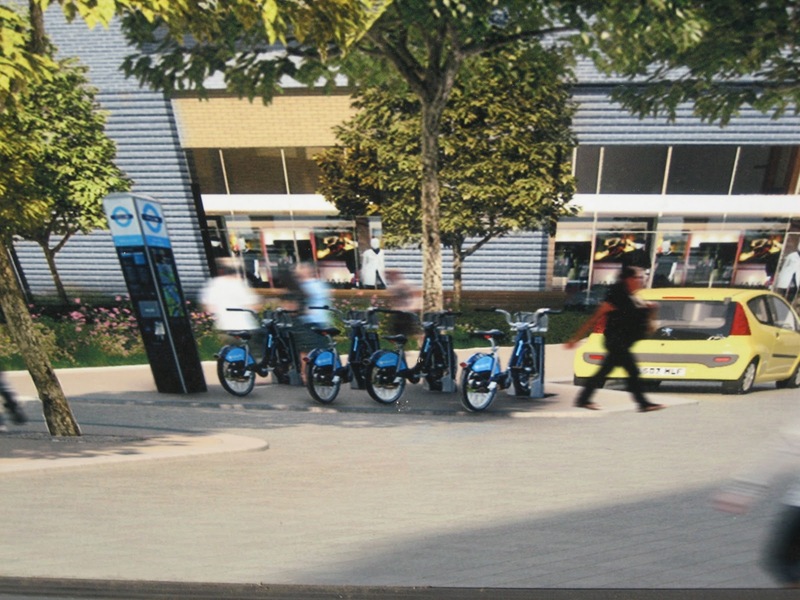 Apparently we're all going to get "Boris Bikes" in the area once the village centre is built. Except of course we're not. The Mayor of London currently has no plans to extend the scheme any further into SE London and is instead pushing it further into his heartlands in the West. 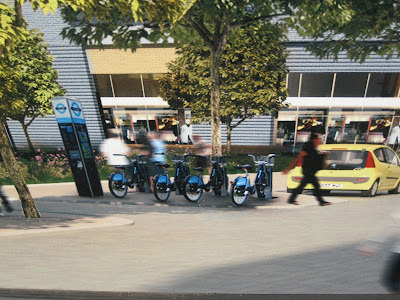 Of course there's always the possibility that at some point we may get the cycle hire scheme here in Kidbrooke, but for now at least it's just another figment of Berkeley Homes' imagination. 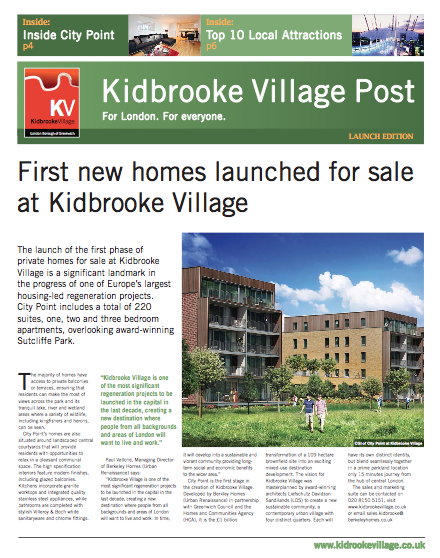 The reality is that despite Kidbrooke Village being sold for it's transport links to central London, our infrastructure is actually pretty mediocre. Transport accessibility in Kidbrooke is currently ranked poor to moderate and even with the planned rebuild of the station, the extra 2900 homes in the area is really going to test it to the limit. 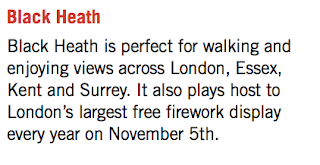 And as for those Boris Bikes? Well, don't hold your breath. Transport for London are trying to block plans for new pedestrian crossings on Kidbrooke Park Road because they would slow traffic. The two new "staggered" crossings would cross Kidbrooke Road at it's northern end where the road currently divides the development in two. But the crossings, which are described as a "fundamental" part of plans for Kidbrooke Village go against the Mayor's policy of "smoothing the traffic flow." "given the current policies on ‘smoothing traffic flow’, further justification is required for the installation of any new signals on the Transport for London Road Network (TLRN)." 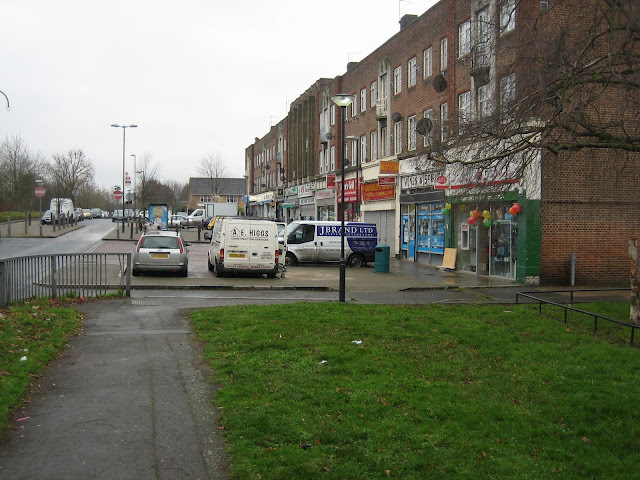 "the proposed crossing arrangement remains something that TfL is unable to support at present"
Links between the two halves of the Ferrier Estate and the wider area have always been bad, a fact that contributed to the sense of isolation many on the estate felt. Developers have sought to fix this problem with the new estate but are running up against resistance from Transport for London. 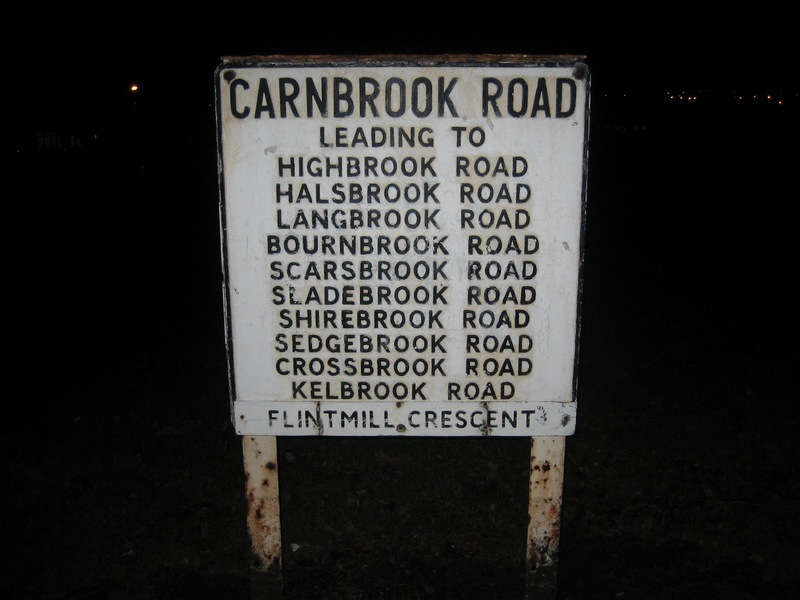 In order to appease their objections, they are now proposing a widening of Kidbrooke Park Road. "It is the intention that traffic will be regularly stopped by the pedestrians crossing. 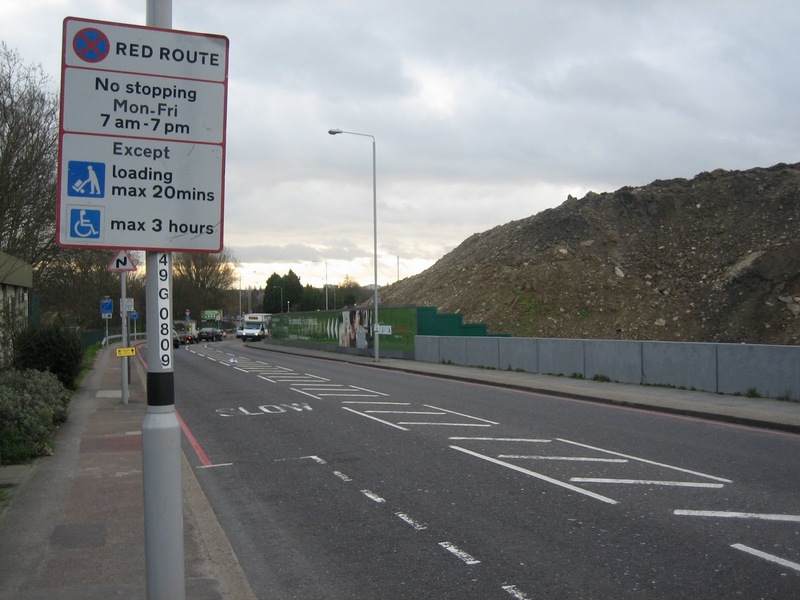 Due to the intentional creation of this conflict for road space, the junctions require additional traffic lanes (where vehicles first move away from a stationary start) in order to achieve satisfactory levels of operation required by TfL." 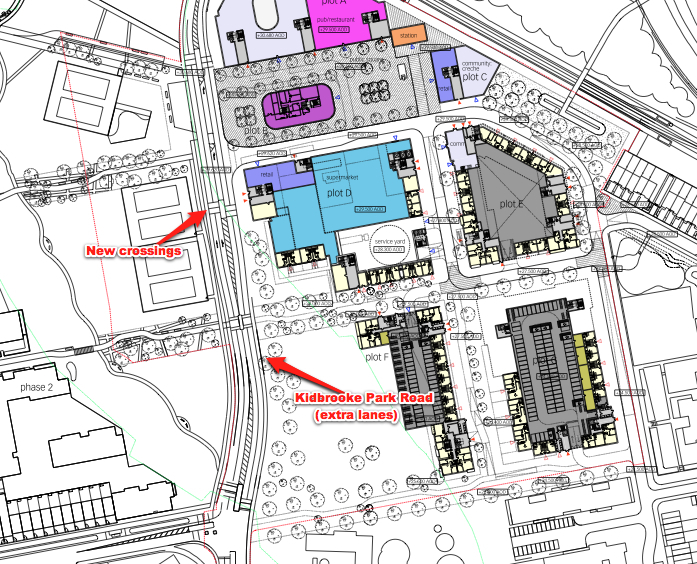 Developers would also raise the Village Centre up to the level of Kidbrooke Park Road, which currently runs on a kind of ridge above much of the development. However, without the new crossings, Kidbrooke Park Road will continue to be a formidable divide running through the centre of the community. So what do you think? Should the new crossings be allowed or should motorists continue to take priority on Kidbrooke Park Road? I understand that Kidbrooke Village developers Berkeley Homes are none too impressed with this website, nor I suspect with the prominence that Google gives us. 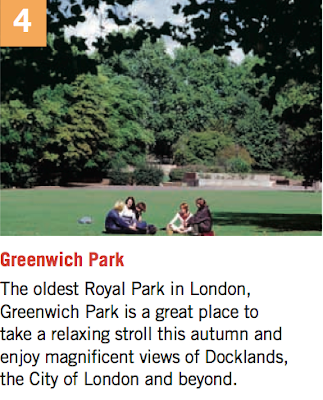 Except that isn't Greenwich Park is it? As anyone who already lives in the area could tell them. 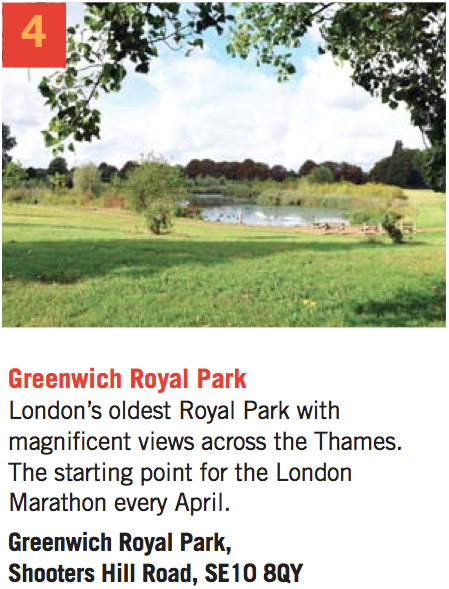 Oh wait they've changed the picture in the latest edition. But where's this? That doesn't look like anywhere in Greenwich Park to me either. Still, pictures of Greenwich Park must be pretty hard to track down. 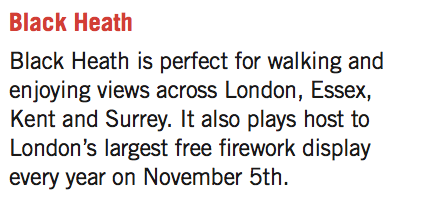 What about other local attractions? Kidbrooke Village claims to be "For London." Unfortunately Berkeley Homes doesn't seem to have even the most basic knowledge of it. 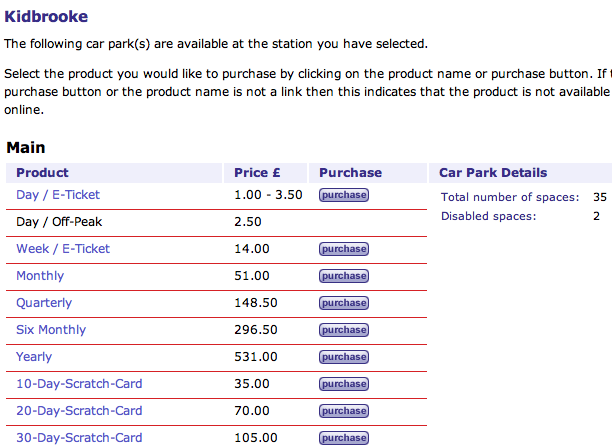 Southeastern have been accused of a rip-off after they hiked parking charges at Kidbrooke Station by almost 30%. 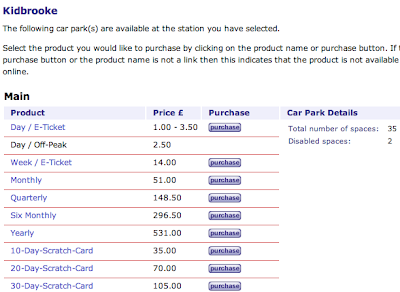 From today one-day parking tickets will rise from £3.50 to £4.50. Trade union TSSA today accused Southeastern of bringing in a "backdoor" fare increase on top of six percent rises in rail fares. 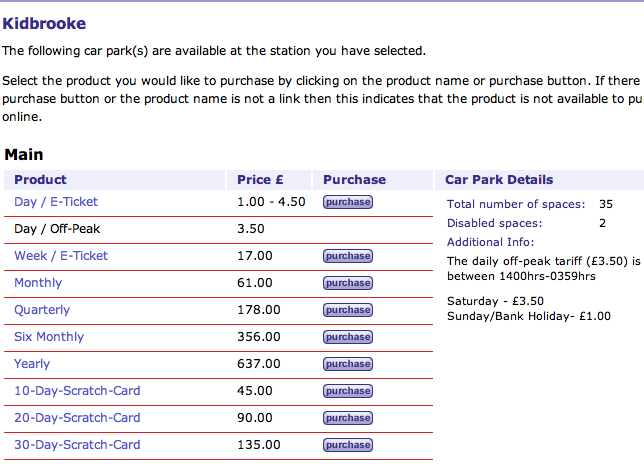 "Car parking increases of almost 30% simply cannot be justified when inflation is 5% and wages are only rising by 2%. They are squeezing the squeezed middle until the pips squeak." I would have contacted Southeastern for a comment about their rises but unfortunately "Southeastern doesn't respond to blogs etc". 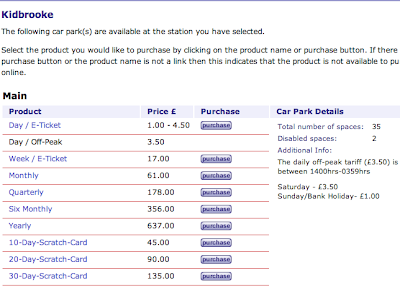 "A small number [of car park prices] have gone up but none more than 50p a day,"
It's one thing to raise the cost of parking by 30% in just one year. It's another thing to then lie about it. Berkeley Homes have been accused of repeating the mistakes of the Ferrier Estate, after they raised the height of towers in Kidbrooke's new 'village centre' to 15 storeys, six storeys higher than originally planned. The high rise towers will be three storeys higher than the supposedly inappropriate 12-storey towers they are replacing. The total number of properties has also risen dramatically to 4800, which is 400 more than was originally agreed and almost 3000 more than was in the original Ferrier Estate. "The increase in the maximum height of the development from 9 to 15 storeys and increasing the number of residential units... represents a major departure from the agreed masterplan. These substantial changes vastly increase the height and density of the development and will have a detrimental social impact. 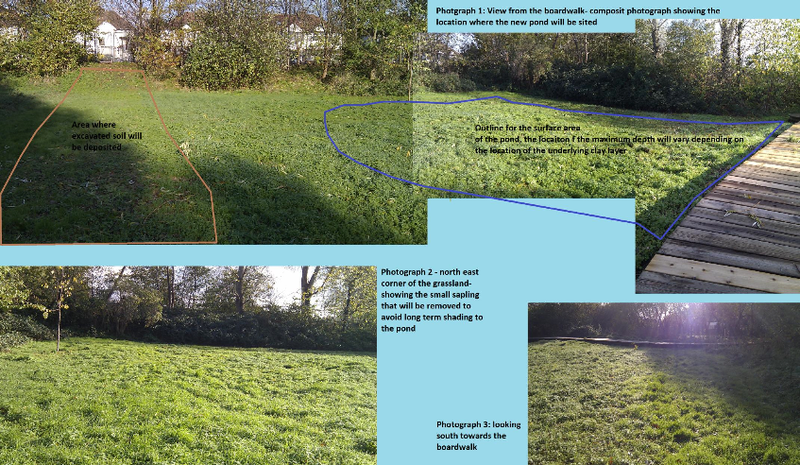 This is a clear case of seeking to overdevelop the site and repeat the errors enshrined in the previous development." The height of buildings outside of the 'village' hub has also been increased in order to squeeze in an extra 400 properties. The original plan only envisaged buildings of up to 3-storeys on the fringes of the estate. Despite these objections from locals, Berkeley Homes and Greenwich Council are pushing ahead with their plans stating that "It is considered that the height of the proposal is acceptable for this site." Are these high rises suitable in what is essentially a suburban location? Will they spoil or improve the local skyline? And will they contribute to the new 'villagey' atmosphere we've heard so much about? Please let us know in the comments or by email. 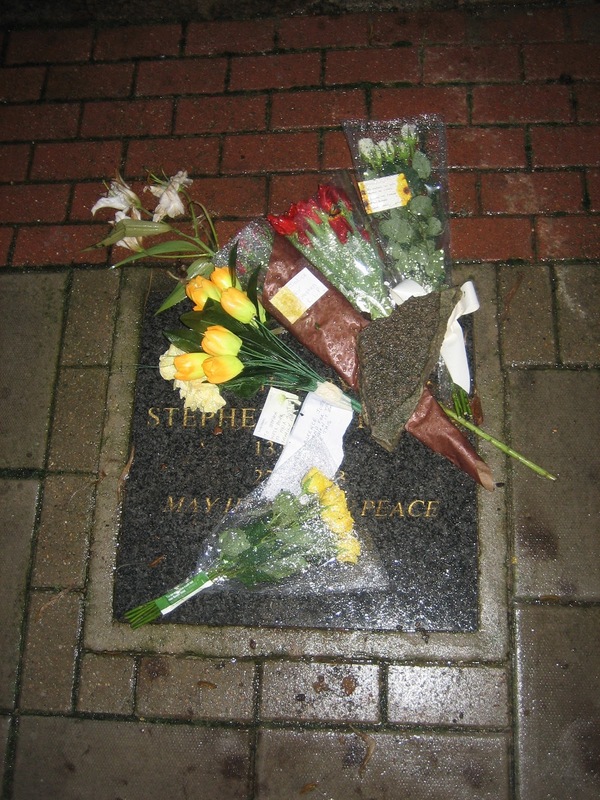 This is a guest post by Lee Cox who grew up on the Brook Estate, Eltham which alongside the neighbouring Progress Estate was home to the racist gang which killed Stephen Lawrence. 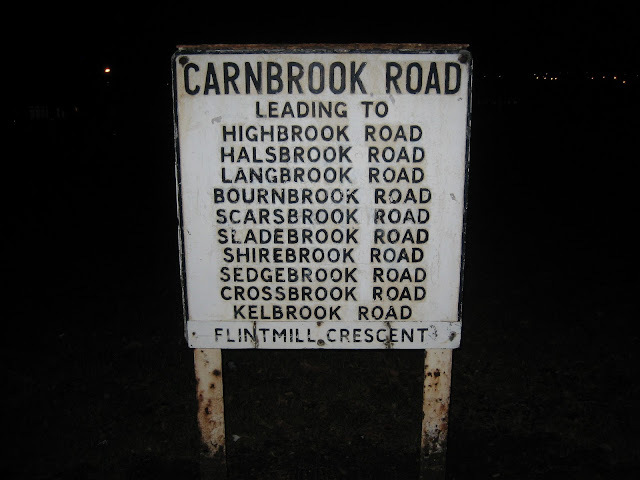 I grew up in a family of four brothers, and for 21 years, always lived in the same street, on the now infamous "Brook Estate." So to the memories, which can be funny things, often romanticised, sometimes chronologically askew, but all very personal, and these, are mine of those years. It was a council estate, and for all of my childhood my parents rented the accommodation, and with many other occupants were working class people (I always struggle nowadays to know if we should or shouldn't categorise by class, but these are memories so I'll stick with it.) Mrs Thatchers right to buy initiative changed that in the eighties. Dad, after living a 'jack of all trades' existence, became, through the guidance and support of mum and his friends who helped him attain the profession through city and guilds classed at night school, a plumber, in the employ of the local authority. Mum did what many wives did and, still do, working one or more jobs in the evenings, to help swell the coffers and fund the ever rising cost of feeding 4 "growing lads". We were all taken to the local toddler group, all went to the nearby primary school, and would play on the green (although of course "no ball games allowed") next to our end of terrace house. We were close to our immediate neighbours, played in each others gardens with their children, and there were various street party's to celebrate the Queens jubilee and the wedding of Charles and Diana. 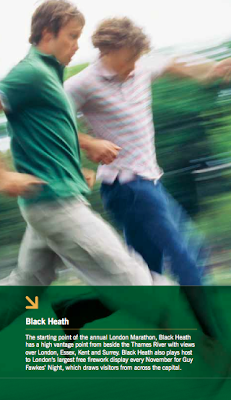 There were the run of the mill events, minor burglaries, accidents in the two uprights of the ladder configuration of roads that comprised the estate. The estate was a rat run for traffic on the Rochester Way/A2, so these accidents and other pressures brought to bear the relief road being built in 1988), yet we always felt safe in our surroundings. In addition to school, we were encouraged by our parents to try various other activities, these included the local youth club, boys brigade and most extensively and life affirming, the Scout Association, which I personally was involved with from the age of 8 until I was 25. None of this was easy for my parents, to either support financially or logistically, but ways were found, clothes were handed down etc etc. 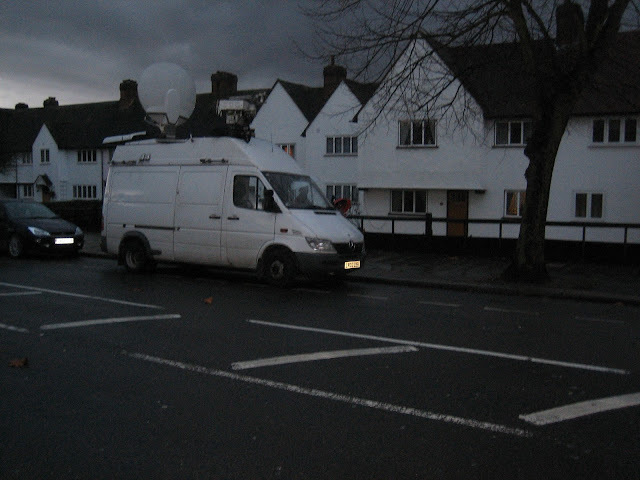 We were always aware of the 'bad boys' and 'street rakers' that lived on or near the estate, but frankly this was never an overbearing problem for us or our parents as they always knew where we were and what we were doing, and more importantly, they were interested in these details. 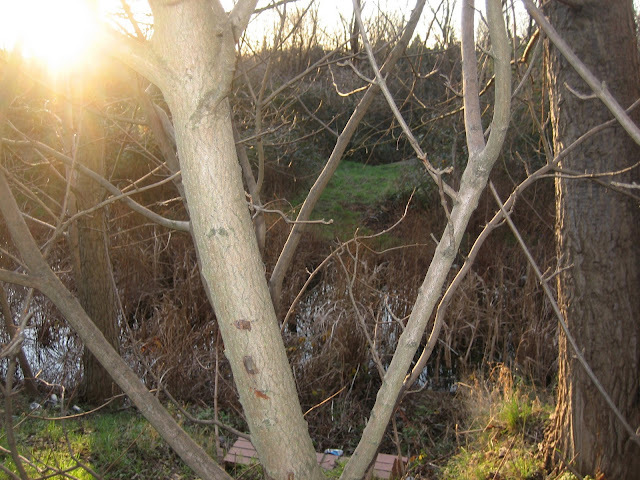 The estate was populated by families from a range of ethnicities. I never felt an overbearing sense of racial tension, this wasn't the 60's, I have always felt that I live in a multi cultural society and the Brook Estate epitomised this. At no time did I perceive a large presence of police, it was normal to see them on the street from time to time of course. The only recollection I have is of my eldest brother being stopped and searched on his way home one day, as he matched the description of someone who had burgled a house on the estate. I think it's extremely sad that the events of 1993 occurred, and that only now any semblance of a resolution has happened. It’s my strong belief that the parental guidance, love and at I and my brothers received is the reason that we never brought any of the disappointment and dark clouds to their door that have surfaced in the press in recent weeks. 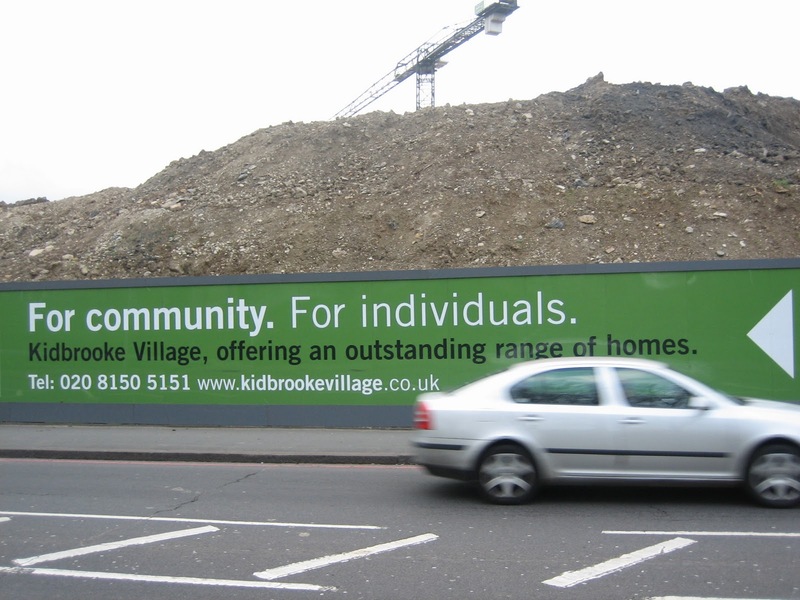 Would you like to contribute something to the Kidbrooke Kite? Please get in touch at the usual address. 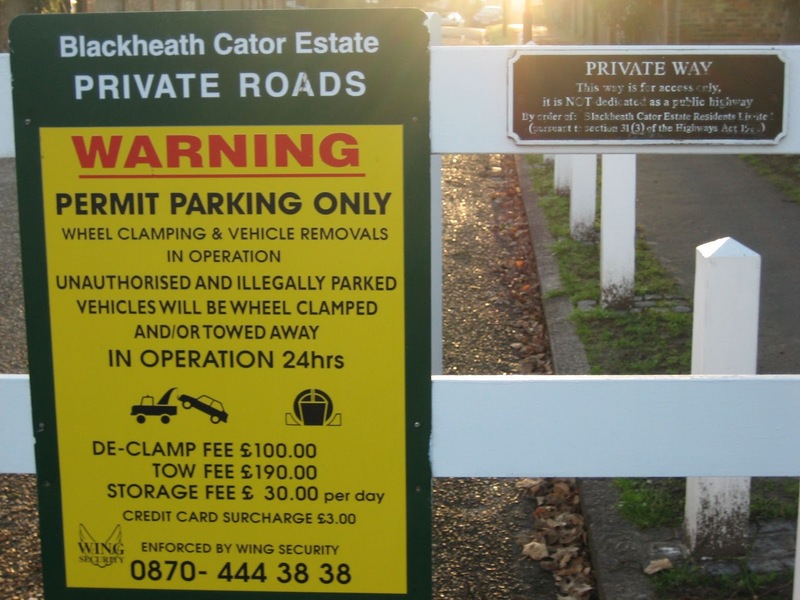 Residents of Blackheath's private Cator Estate are to be banned from clamping vehicles on their land. In an attempt to outlaw "rogue clampers" the government's Protection of Freedoms bill will prohibit all but local councils from using wheel clamps. "By criminalising clamping and towing on private land this Government is committing rogue clampers to history and putting an end to intimidation and excessive charges once and for all." 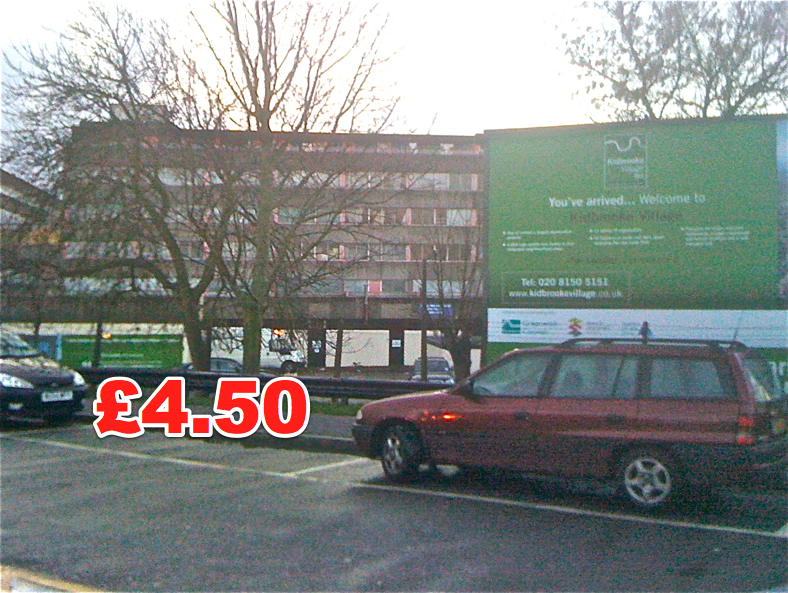 As the above photo shows, people parking without a permit on the Cator Estate can expect to pay pretty steep charges to collect their vehicles. The Cator Estate's management board have been lobbying the government for a special exemption from the bill but to no avail. "The government’s Protection of Freedoms Bill, currently going through the last stages of the legislative process in parliament, contains a clause that will ban wheel clamping on all private land. It gives no concessions for estates such as ours to derogate from the ban. The board, with the help of the Rev Adam Scott, has been lobbying our local MPs, and members of the House of Lords, to exclude estates such as ours from this provision. However, we are advised that the clause will remain in the Act which is likely to come into force early next year and the Board has therefore decided to implement the only available alternative to deter illegal parking on the estate." The estate will now switch to handing out parking fines instead. 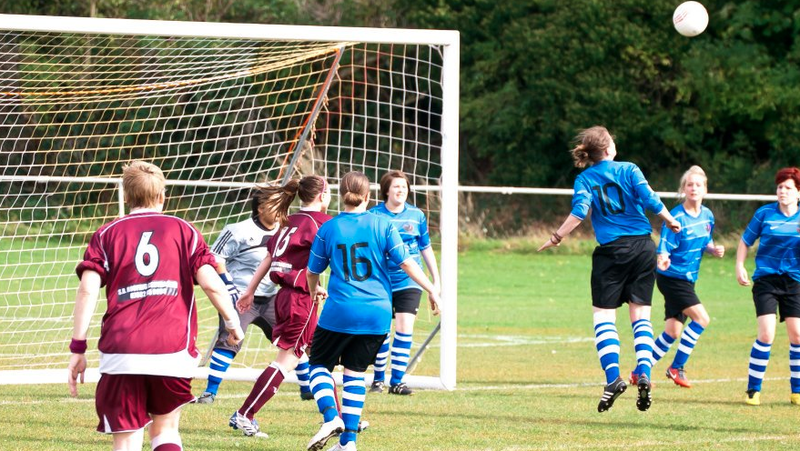 The new fines will come into effect in either late February or early March. It is not yet known at what level they will be set. See also: Cator Estate becoming a gated estate - Kidbrooke Kite.